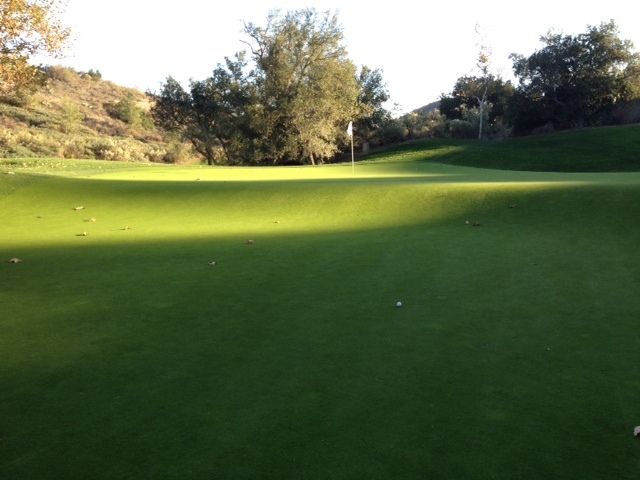 I’ve been reflecting on my 2013 golf season a lot recently in preparation for a few year-end golf posts. Naturally, “best holes” is a topic I’m pondering and it got me thinking about all the truly great par-3s I’ve played this year. Well, I added another one to the list on Tuesday. This is No. 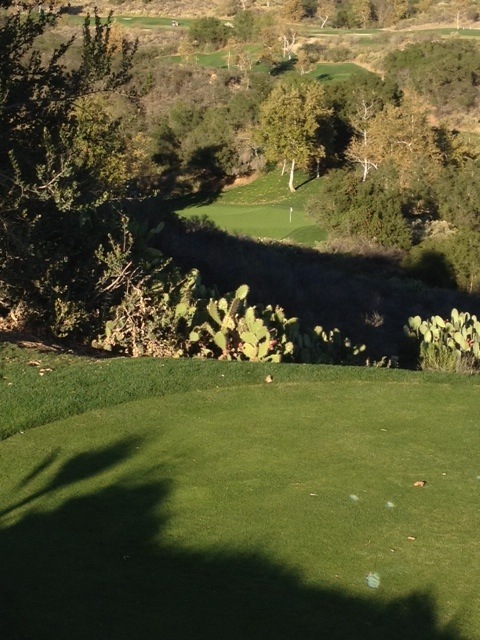 17 at Dove Canyon Country Club, and, yes, that tee shot is as daunting – and fun – as it looks. This is the view from the Nicklaus tees (Nicklaus is the designer) and measures 205 yards. We played it at 162 yards from the Championship tees, but it was still like hitting it off the side of a seven-story building. Not wanting to be short, I hit an easy 8 iron, which was way too much club. I flew the pin and just barely held the back of the green. I should’ve hit pitching wedge. Anyway, the tee shot is only half the battle here. There are dramatic drop-offs on the front AND back of this green. I was faced with the latter, which meant putting over a 3-foot ridge in the green that resembles what an emerald wave would look like coming at you on the beach. I cleared the ridge and then watched my putt not slow down one iota and end up on the fringe. Mark me down for a rare three-putt bogey. Played properly this isn’t one of the course’s tougher holes (it’s the No. 18 handicap) but it certainly is one of its more memorable ones. And it’s actually a welcome breather from what is a “Bear” of a back nine. A long elevated par-3 and the tightest par-5 I’ve ever played greet you on the back. Then thick rough makes some shorter holes play longer. My swing was running on fumes when I arrived at 17. 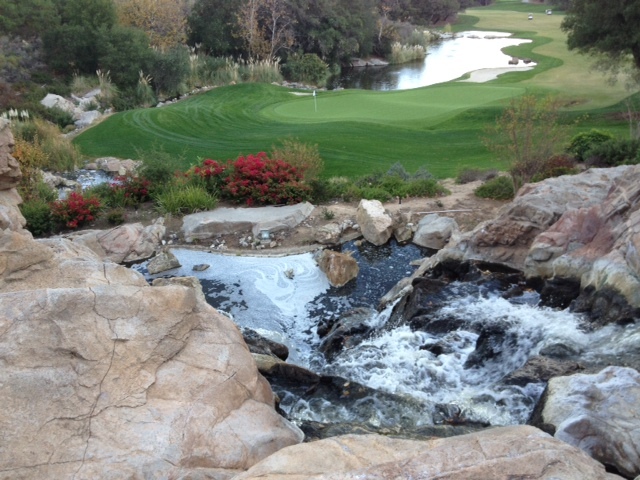 But 17 and 18 – a 389-yard par-4 to a waterfall finish – are a fantastic finishing combo. I probably would’ve made 18 this feature but I was too busy taking deer pictures and making triple bogey. Oh, well. Better luck next time, right? I’d heard much about Dove before my round and it more than delivered on the anticipation and expectation. It’s certainly among the best courses I’ve played this year and I would love another crack at it. This entry was tagged Dove Canyon, Jack Nicklaus. Bookmark the permalink.